While 2010 saw many historic successes in spaceflight andspace science, plenty of things went wrong, too. For example, several rockets failed to deliver theirscientific payloads, Japan's Venus probe Akatsuki missed the planet entirely,and a NASA balloon crashed spectacularly in the Australian desert, destroying its telescope payload and smashing into a parked car. 2010 saw many failures in the launch and deployment of payloads, and theproblems had a real international flavor. On Dec. 5, for example, an overfueled Russian-built Protonrocket failed to put three new Glonass-M navigation satellites into orbit; theycrashed into the Pacific Ocean near Hawaii. India had troubles of its own, withback-to-backfailures of its Geosynchronous Satellite Launch Vehicle, in April and onChristmas Day. In late October, the European communications satelliteEutelsat W3B launched cleanly and made it to orbit. But the satellite?s fueltank developed a sizable leak, and engineers soon declared the craft a totalloss. The United States had some problems, too. In April, thePentagon lost contact with a hypersonic glider test vehicle shortly afterlaunch. And NASA's prototype solar-sail satellite, NanoSail-D, apparentlyfailed to eject from its mothership satellite as planned in early December. In a highly visible blunder, a huge NASA ballooncrashed in central Australia before it could lift a $2 million telescope to its high-altitude observation station. On April 29, the 400-foot (121-meter) balloon carrying theNuclear Compton Telescope, a gamma-ray instrument, blew sideways instead oflifting up. A NASA investigation later cited human complacency as theaccident's cause. The pricey payload dragged along the ground. Itdisintegrated spectacularly and smashed through a fence, narrowly missingseveral spectators and heavily damaging a private vehicle parked nearby. AYouTube video of the mishap drew over 160,000 views. On April 5, the Intelsat Galaxy 15 communications satellitestarted acting like a juvenile delinquent ? it stopped responding to commandsand started wandering out of its assigned orbit, threatening other satellites.The satellite may have been knocked out of commission by a massive solareruption, according to its manufacturer, Orbital Sciences Corp. of Virginia. Strangely, the C-band telecommunications payload aboard thesatellite kept working, transmitting signals that threatened to interfere with thoseof nearby satellites. However, this story has a happy ending: On Dec. 23, Galaxy15's onboardbattery became drained of all power, and the satellite automatically resetitself as it was designed to do. Zombiesat no more! In January, NASA engineers consigned the Mars rover Spiritto a fate stuckin deep Martian sand. ?The rover, which had rolled for six years over the RedPlanet's surface, became mired in a location called Troy in May 2009. Spirit's controllersprepared the vehicle to weather another harsh Martian winter, but it went intohibernation March 22 and has notresponded to signals since. Mission scientists still hold out hope that Spirit may comeback to life in March 2011, when sunlight to power its solar arrays will shinestrongest on Mars. But while it remains unresponsive today, Spirit can hardly beconsidered a failure. The rover and its twin, Opportunity, far outlasted theiroriginal 90-day missions. And Opportunity is still going strong. On July 31, an ammonia coolant pump on the InternationalSpace Station failed, knocking out half of the station's cooling system.Astronauts were forced to halt some experiments, and turn off some systems and leaveothers without backups, to keep the station from overheating. The problem turned out to be a major technical malfunction,but not a catastrophe. At the time, NASA called it the oneof the mostchallenging repairs for the InternationalSpace Station ever attempted. Astronauts fixed things during three separate spacewalks,removing the faulty pump and replacing it with one of four spares stored on thestation's exterior. By Aug. 17, the crew had begun reactivating some of the systemsand bringing the station back up to normal operations. In 2010, President Obama's newvision for NASA called for the space agency to abandon its moon-orientedConstellation program and focus on getting humans to an asteroid by 2025, andto Mars by the mid-2030s. The plan also relies on foreign spacecraft to resupply thespace station shortly after NASA's space shuttle program retires in 2011. The longer-termgoal is to encourage the development of American commercial space capabilities,allowing private companies to eventually shoulder much of the load. While many have lauded NASA's new direction, others haveassailed it on several fronts. Some, for instance, don't want to see Constellationget the ax. In late December, the House of Representatives passed a short-termappropriations bill, H.R.3082, prohibiting NASA from initiating new programs and requiring theagency to continue funding Constellation. Some lawmakers are also upset about the looming reliance onforeign spacecraft. And some congressmen ? as well as seasoned NASA astronautssuch as Neil Armstrong, Gene Cernan and Jim Lovell ? have publicly stated thatthey have safety concerns about NASA's future reliance on private spaceships. 2010 was a frustrating year for the space shuttle Discovery. It was slated to make its last-ever flight in November, todeliver a storage room and a humanoid robot called Robonaut 2 to the spacestation. However, engineers discoveredcracks in parts of the shuttle's external fuel tank shortly before launch. Whilethey investigated the cause of the cracks, they pushed Discovery's launch back,first to December and then to early next year. As it stands, Discovery will launch no earlier than Feb. 3,2011. ?The latest inspection of the shuttle has revealed a new set of crackson the external tank which NASA is now analyzing as well, the pace agencyannounced Thursday (Dec. 30). 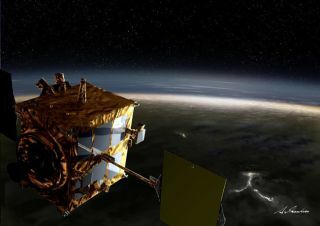 In the saddest space misfire of 2010, the Akatsuki probefailed in its mission to enter Venus orbit. After more than six months ofinterplanetary travel, the $300 million Japanese spacecraft ? which was tostudy Venus' atmosphere and weather in unprecedented detail ? sailedpast the planet on the night of Dec. 6. Akatsuki's thrusters were supposed to fire for 12 minutes toslow the craft down enough for Venus' gravity to snag it. But an investigationdetermined that an unexpected pressure drop in the spacecraft's fuel linecaused the engines to conk out after only 2.5 minutes. Akatsuki's failure made Japan 0-for-2 in interplanetarymissions; its only previous effort, the Nozomi mission to Mars, was declared aloss in 2003. Akatsuki is now in orbit around the sun. Mission scientistsplan to try another orbital insertion when the probe gets close enough to Venusagain ? likely sometime between November 2016 and January 2017. You can follow SPACE.com senior writer Mike Wall onTwitter: @michaeldwall.